Our watchmaker John Mitchum, Bradley University’s Westlake Hall’s school of horology— the art of making timepieces in 1961. 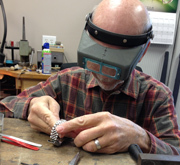 John has worked on virtually every make and model of watch over the past 40 years. Please let us help you with any watch repair need you might have. There are not many watchmakers who are still working on fine watches; we’re fortunate to have one of the best.